The New England Patriots defeated the Houston Texans, 27-20, during the NFL’s first full Sunday of action. In spite of a fumble and benefitting from a dubious completion that went unreviewed late in the second quarter, this was still a vintage Rob Gronkowski display. Matched up against a variety of Texans’ defenders, simply put, none of them could meet the physical challenge of keeping Gronk away from the ball. Up the seam or on back shoulder throws, there simply was no match for Gronkowski, who hit the ground running to help the Patriots on their way to another victory. Not in the limelight, but Phillip Dorsett put up a strong performance that included his first touchdown since Week 15 in 2016. Often pigeon-holed as a deep receiver due to his speed, Dorsett did his best work in the short and intermediate areas today contributing to Kevin Johnson‘s rough outing both with his route running and his work after the catch. With Julian Edelman out for another three weeks, Dorsett figures to have plentiful opportunities in the weeks to come. It was a multi-pressure outing for Trey Flowers to open the season, who followed Julie’n Davenport from left to right and generally made his day a misery on both sides. Flowers extends his streak of recording multiple pressures in a game, which stretches back to the Patriots’ Super Bowl win over the Falcons. He capped off the day with his fourth-quarter sack through an attempted hold by Davenport. Ja’Whuan Bentley came in with a reputation as a player who could deliver stops for the Patriots, and he provided multiple in his NFL debut. Bentley played some with Elandon Roberts but relegated the veteran the bench not only with strong downhill play against the run but solid play in underneath coverage to accentuate a strong three down showing on debut. During the first half, it looked like J.J. Watt was in for another quiet game against the Patriots, but he reminded all those watching of his extraordinary talents in the second half. Watt racked up multiple pressures and stops in the second half, coming alive when given the opportunity to go up against LaAdrian Waddle in the third quarter and continuing his disruptive display throughout the second half, even when Marcus Cannon was on the field. A mixed day for the Texans’ secondary with Johnson struggling in coverage in the red zone before leaving late in the game due to a head injury. However, there were positive signs from Tyrann Mathieu and Kareem Jackson, as both looked like productive contributors when coming forward against both run and pass. Jackson capped off his display by cutting down James Develin on the Patriots’ final third down to at least give his offense a shot at a 99-yard miracle drive. It was a real Jekyll & Hyde performance from sophomore quarterback Deshaun Watson in this game, but in the end, his performance was better than it looked like being halfway through the game. Some poor mistakes early in the game led to turnovers, and some wayward accuracy led to plays left on the table as well as the big plays surrendered to the Patriots’ defense. 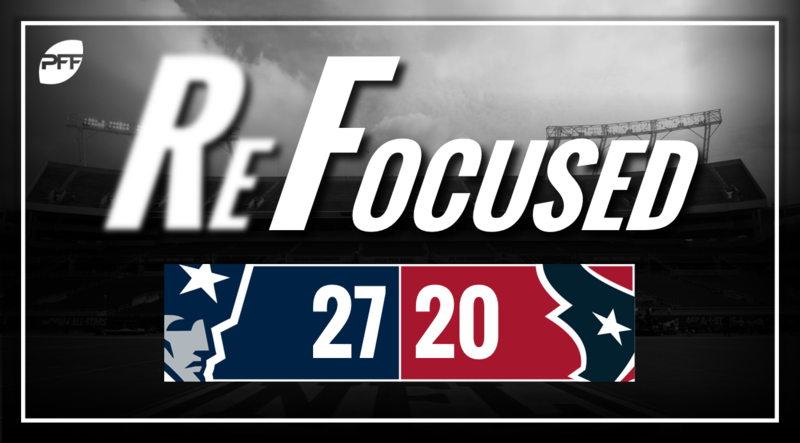 He grew into the game in the second half, though, as the Texans’ ground game got going and some effective short passing helped turn his performance around a little as his offensive line found their feet later in the game. A rough outing for Davenport was made all the more difficult by being forced to swap sides midway through the game when Seantrel Henderson was injured. On either side, Davenport struggled in pass protection, surrendering multiple pressures to an array of Patriots’ pass rushers. Rookie Martinas Rankin, who replaced Davenport at left tackle when Henderson went down, fared little better. The Texans’ interior held up well in pass pro, but the Texans’ bookends have plenty of room to grow from here. Presented with a quarterback who likes to hold the ball in the pocket and a raw offensive line, the Patriots’ pass rush did not disappoint. Led by Flowers, they ultimately didn’t allow Watson the time to settle into the game until it was too late to mount a successful comeback. A rough start from Watson dug a hole too deep for the Texans to overcome in Foxborough.